Sort of an Alice in Wonderland for our topsy-turvy times, Mia Chung’s You for Me for You takes us through a very specific lookingglass: a refugee’s experience attempting to flee North Korea. Like any good leap of imagination, this one begins grounded in reality. Sisters Junhee (Grace Ng) and Minhee (Kathryn Han) live a hardscrabble life of menial office work (Junhee) and illness (Minhee) brought on by malnutrition. Repeated trips to a government doctor result in meaningless red pills and, ultimately, frustration and a small act of defiance that pushes the fearful sisters to want to attempt a crossing into South Korea. From there the play gets wacky as the sisters’ paths diverge. Minhee falls down a well, goes through a small door she finds in the wall and attempts to sort out her life and relationships with her young son and missing husband in a sort of slow-motion dream-state North Korea. Meanwhile, Junhee makes it to America, where time moves much more quickly, she gets a job as a hospital orderly, acclimates herself to American life and meets a nice man from the South. In the Crowded Fire Theater production now at the Potrero Stage (the newly and beautifully refurbished – and climate controlled! – space formerly known as Thick House), the sisters’ journey plays out in about 90 engaging minutes, with the characters around the sisters adding a sense of whimsy and emotional heft to their separate journeys. 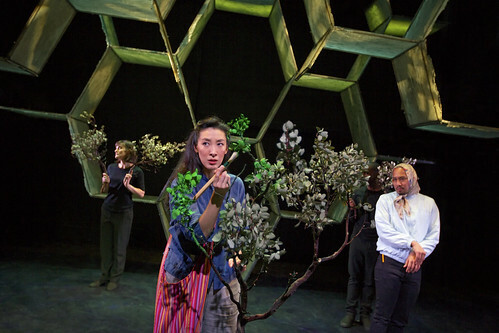 Director M. Graham Smith establishes a world where anything can happen with a stage dominated by set designer Maya Linke’s tattered and battered honeycomb sculpture. One minute we’re in a well where Minhee meets a talking frog, and the next, we’re at the American border, where Junhee interacts with a customs agent speaking English the way she hears it, which is to say, like garbled nonsense. While Minhee’s time in the well/North Korea is dark and emotionally fraught as she tries to locate her 10-year-old son (who may or may not be dead) and her husband (who may or may not be dead), Junhee’s time in New York is brighter, louder, brasher (and, for the audience, a whole lot more fun). Minhee’s emotional journey is populated by oddballs, brokering bureaucrats, fellow wanderers and mysterious old women in the woods, and they’re all played by the wonderful Jomar Tagatac. 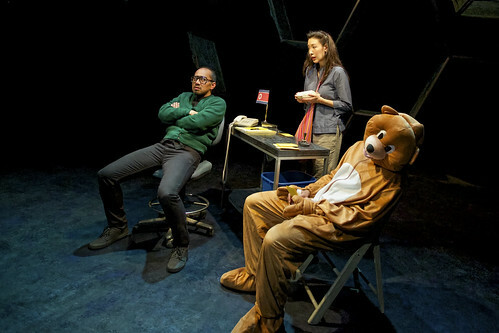 Sinister and funny, Tagatac’s creations are among the play’s best, and the tone of dark whimsy gets deadly serious during one of his character’s litany of horrors suffered at the hands of the North Korean government. In New York, Junhee encounters many different women – hospital patients, fellow workers from the ICU, a therapist, the hospital HR rep – and they’re all played by Elissa Beth Stebbins, who conquers the daunting task of having to speak the garbled English that Junhee hears when she first arrives. As her time in the U.S. progresses, we understand more and more of the English, but, happily, Stebbins’ performances just keep getting brighter and funnier and more pointed. Charismatic Julian Green straddles both worlds. In North Korea he’s a talking bear, and in New York, he’s Wade, the man from Alabama, who charms Junhee, though she is compelled to keep him in the friend zone. The contrast between the sisters’ experience is pointed, and though there were some pacing issues at Monday’s opening-night performance, You for Me for You is a rich, imaginative exploration of the refugee experience from two very different points of view. We also get, thanks to Ng and Han, a strong sense of the sisters’ devotion to one another. The humor and the wonderland-ish tone keep the play buoyant, but a grim sense of sacrifice, pain and dissociation looms to keep a fantastical telling grounded in reality.